Isn’t it interesting how every Spring feels like the very FIRST Spring? On our way to church last weekend we were all marveling at the blossoms on the cherry trees, the tiny leaves sprouting on the lining the road and all of the daffodils popping up in on every corner. We were so excited, pointing at this tree and that group of flowers. You would have thought we had never seen them before in our lives! Nothing captures the feeling of ‘new-ness’ quite like the season of Spring. It’s all about growth…fresh starts…rebirth. I wish I could just bottle up the scent that lingers in the air and carry it around with me so I could inhale it whenever I needed a little pick-me-up. But, alas, I’ll have to settle for trying to capture the season through crafts! 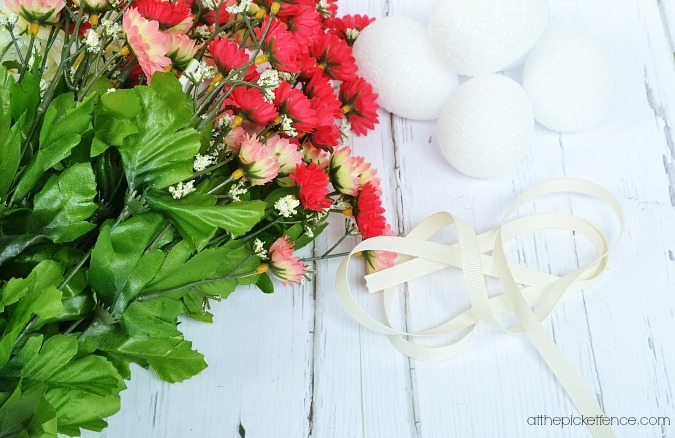 Directions: Simply pull or clip the flowers off the stems and using your hot glue gun, attach to the foam eggs being sure to nestle the flowers closely together. Work your way around the egg until it’s completely covered and then attach a ribbon to the top with hot glue gun. I clipped this branch from our pie cherry trees in the backyard. It looks so expectant, doesn’t it? It’s just waiting to burst forth in all of it’s glory. And, believe me, when it does it is definitely glorious! But, until then, I will just enjoy my little Flower Easter Eggs dangling from it. And I will enjoy the inspiration I see bursting forth from others too! 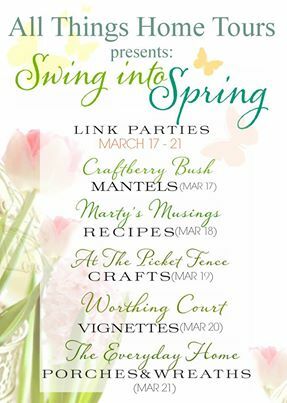 I’m so thrilled to be joining all of these talented ladies as we Swing into Spring! 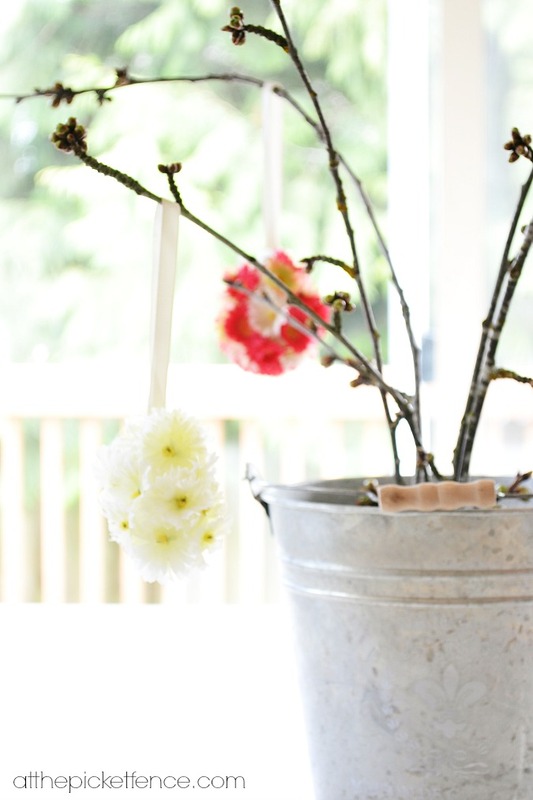 Today we’re talking Spring Crafts and I’d love it if you would hop (get it…hop…Spring…Easter bunny?? I crack myself up!) over and visit the other gals co-hosting with us today. 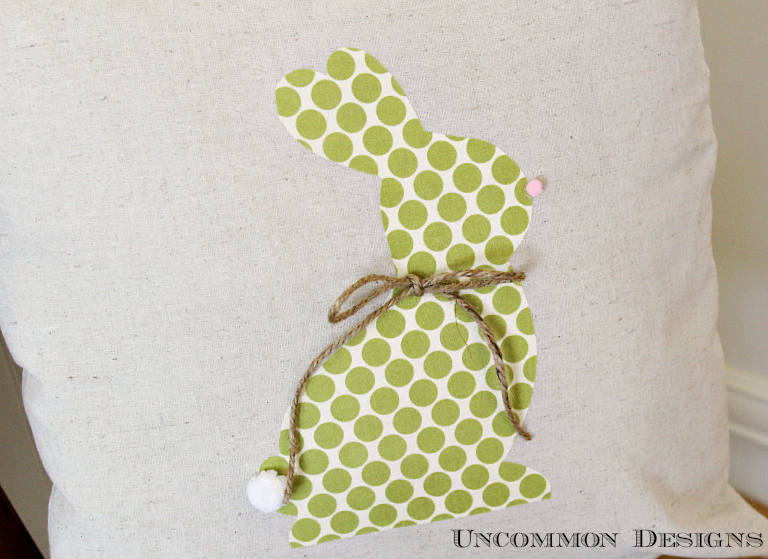 Over at Uncommon Designs you will find out how to make this adorable Bunny Applique Pillow. 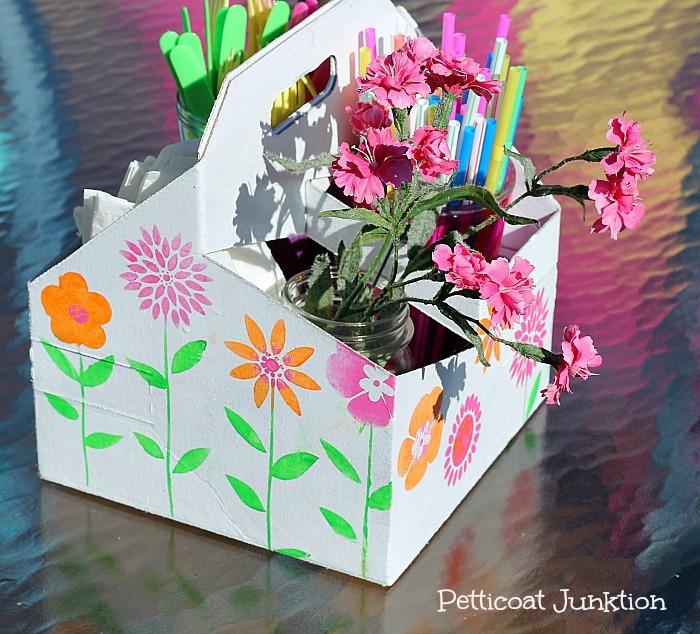 And at Petticoat Junktion you can find out how to make this fun picnic caddy! And after you check those out, you’ll want to see all of the amazing Spring projects from this week! Now it’s YOUR turn! 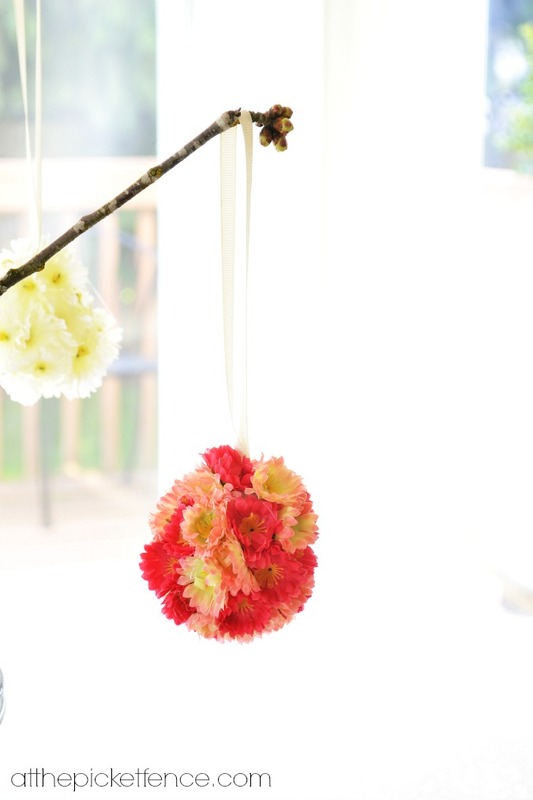 We want to see what Spring crafts you have created so link them up here and join in the fun! 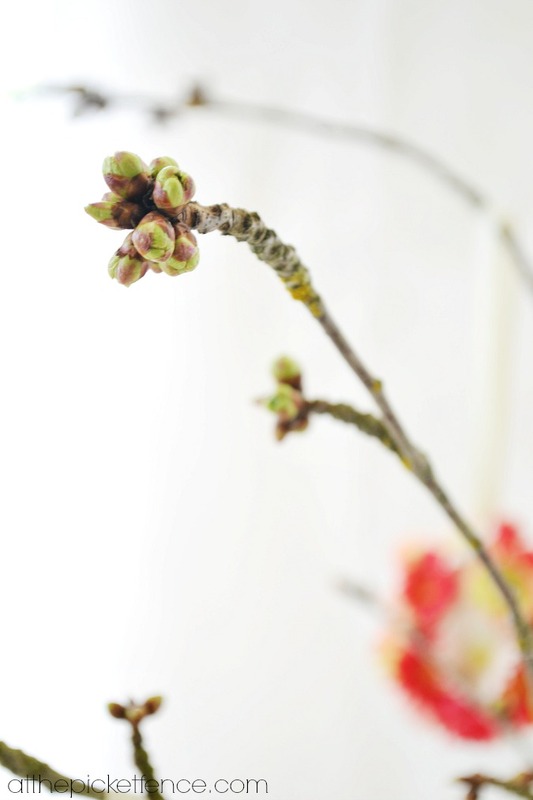 35 Comments on "Flower Easter Egg Tree & a Spring Party"
What sweet creations you added to your branches while you are waiting for them to bloom….I love it! Hope you enjoy the remainder of you week! I love this. It’s so sweet-looking. And I need some of those foam eggs! I have a project in mind and was wondering what to use. Thank you so much for hosting sweet lady. 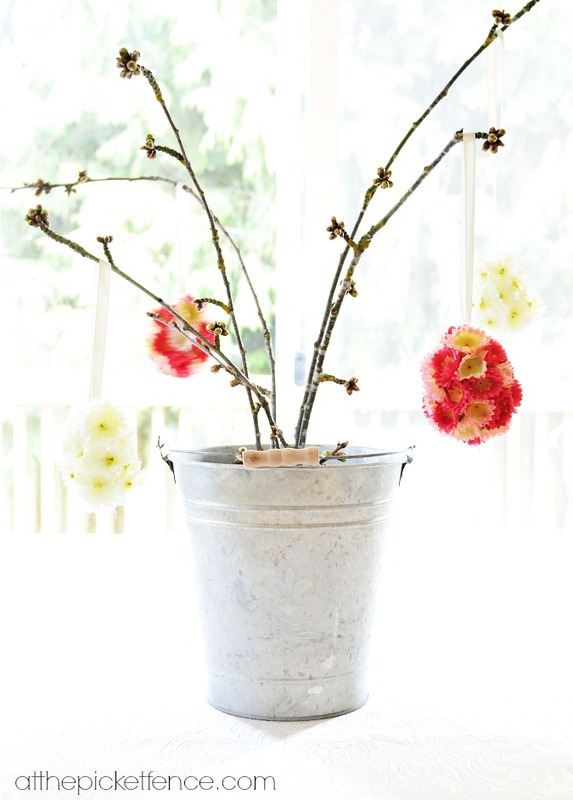 Love your cherry blossom branches. 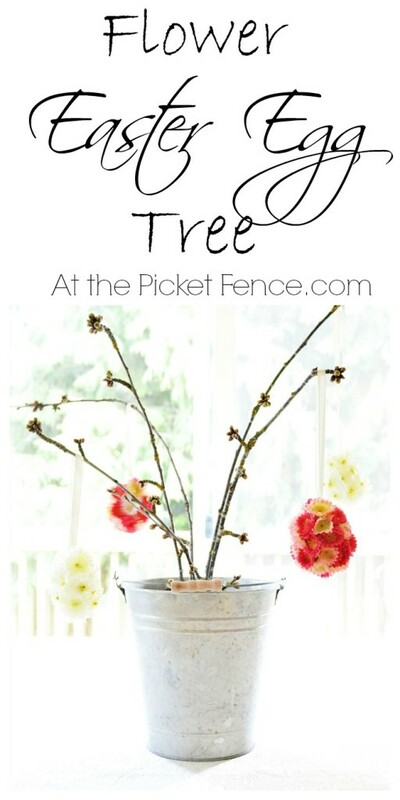 What a great idea for an Easter tree! Thanks for hosting this fun party too. Can’t wait to check out the links! This is such a cute idea! I wish we had trees budding…it is still blah here. The snow just melted…but of course we might get more in a few days! Thanks for hosting…looking forward to finding new great blogs! Cheers! Just love your adorable “flowering egg” tree!!! Love the tree Vanessa. I would love to make those eggs but that hot glue gun is torture!! So glad to co-host the party with such lovely girls.Have a great week! What a gorgeous craft! And yes, yes, YES!! I am SO ready for spring. This seems to have been a particularly severe winter for the whole country… even here in the deep south. It’s like the world is letting out a deep ‘ahhhhhh’ as spring arrives! That branch does look “expectant”. I agree Spring is so NEW every year. LOVE your flowering egg tree! Great to be on tour together! I always love your photography and now I’m thinking I need to knock down a wall in my house so I have a decent place to shoot! My windows are so inconveniently located where I can’t get to them. Don’t they know a blogger needs light and bright? Sad. Thank you for joining us on our tour and hanging out with us! Gosh if that is not the sweetes little tree in a bucket. I really love it. I am really loving the theme/design of your website.Do you ever run into aany internet browser compatibility issues?